Following Oseikrom Abrantie Freestyle which was released almost a year ago, Kinpee has returned with another freestyle and it’s safe to say, M.anifest’s Tim Westwood’s freestyle had something to do with it. Kinpee’s last tape was released in December, 2015 after which he has released only one song. It seemed like he was going to be gone for a while but this line “Ohene’s return from Seychelles, the king is home” may imply that he may be contemplating dropping another project soon. During the little hiatus, it seemed Kinpee was struggling with changes in his life and this was made evident on Oseikrom Abrantie Freestyle. 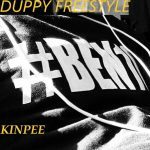 This theme is further highlighted on the Duppy Freestyle but it seems he may have finally found a way to deal with his issues. The line “Hashtag Ben10 on black T / Until we meet again my brother hope you rest in peace.” speaks of the demise of his close friend who was affectionately known as Ben10, really hit Kinpee hard. Check out the freestyle and drop a comment. Do not forget to SHARE!